When I was running a creative department a few years ago, I decided to make a film about creativity at the agency. Not about my department, but about people in accounting, account services, production, catering, media, and human resources. When I first put out the request for people to tell me about their creativity, the silence was deafening. Wasn’t that the job of my people? But I insisted, and soon uncovered lots of examples of hidden creativity. People who never saw fit to mention it in the office, went home and cooked incredible pastries, played the banjo, wrote sci-fi stories, won prizes for their roses, build radio-controlled helicopters, were in the Guinness Book of World Records. The film was a smash and it opened all of our eyes. By removing labels, we discovered the hidden assets in our company. And we started using those assets in new ways, inviting new people to brainstorming sessions, giving them problem-solving assignments, asking them to help us crack the tougher nuts. Soon the whole agency was a creative resource. Instead of a few dozen people in my department, I could call on the whole staff. We just don’t know where answers will come from. And when we insist on judging situations prematurely, we limit ourselves and our potential. Instead, we need to open up and stow the labels. Invention doesn’t land neatly. We have ideas and don’t know where they go or what their purpose is yet. We need to honor those ideas — especially if they seem like mistakes. For example, misconceptions are a sort of mistake that can lead to innovation. You mishear the assignment, you misread the brief, you misunderstand the problem, and 1+1 don’t make anything coherent. Because the puzzle won’t snap neatly together, you really scrutinize the pieces. You come up with all sorts of explanations for this perplexing situation. You dream up new theories, new explanations for how things work. Maybe you get a new tool and you toss away the instructions unread. You find a box of paints you’d forgotten about in the back of the cupboard and discover they don’t mix like they should. You visit a new country and can’t understand how they can eat what they do. Most of these musings lead nowhere — after all, they’re built on a foundation of error. But some of them, maybe just one, pivot your thinking, open your eyes to a whole new perspective. Your imagination struggles, flails and then comes up with a link no one has ever seen before. If the pieces fit too neatly, you’d be stuck doing the same old same old. Sometimes knowing too much means not having room for the answer. Out of the mouths of babes (of all ages and all departments) come surprising insights, based not on experience, but on a fresh point of view. Don’t be afraid to fail. Don’t shun your mistakes. Don’t burn bridges. Our wastepaper baskets contain the seeds of revelations and brighter tomorrows. Next Post You talkin’ to me? So true about how we have ideas but don’t know their exact purpose yet. I record ideas in a Moleskine and I often surprise myself when I use it days or years later, and then I use it in a completely different way than when I first thought up the idea. 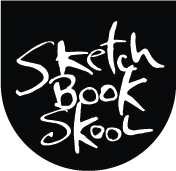 Love how you inquire and inspire…proof of your power to release creativity in people over at Sketchbook Skool. Thanks! Oops! Forgot to tell you how much I like this sketch. I really like this. My “puss pages” (or aka Julia Cameron’s Morning Pages) are excellent for this. Several times a week I squeeze out all the “puss” from my head and it naturally frees up space for good stuff. Whenever I stop the practice I get stuck again and grapple in the dark with the perplexities of life. There’s always a solution, as you so wisely muse, just not always where we think we may find it. Great post this. Thank ye. 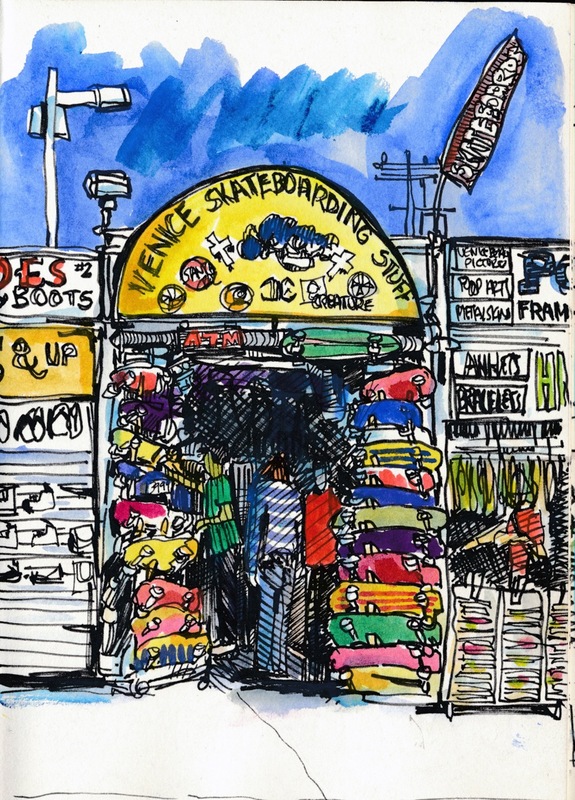 I know this place in Venice beach, you make it more beautiful than it really is. Accuracy is not my forté.